Iris Pseudacorus or yellow flag iris is a perennial belonging to family Iridaceae. This plant is fast-growing and can invade wetlands and backyard landscapes easily. This species comes from Europe North Africa and Western Asia. They invade and form dense growth as shown by my image. It can reduce water movement and prevent the growth of other aquatic plants. Yellow Iris plant has become naturalised widely and is used as garden plants. However, in some areas of the world, growing yellow iris is restricted as they are considered as noxious weeds. The plant has toxic properties and is not safe to consume. This moisture-loving iris has green or bluish green long strap-like leaves. The leaves are usually 1metre long and 30 mm wide with a mid-rib. The plant reaches a height of about 150 cm. The flowers are large and bright yellow coloured with three broad and three narrow lobes. The flowers are produced on a flattened stem. The flowers flutter in the breeze like flags and hence the name. They are produced from October to January or early summer in Australia. The seeds are three-angled capsules with glossy green colour. The capsule contains many smooth and flattened seeds just like a Louisiana Iris. Iris Pseudacorus loves full sun or partially shaded areas with average moisture or wetlands. It can grow in normal or clayey soil. It can tolerate highly acidic soil. Several plants remain connected to each other through rhizomes. The rhizomes can survive severe drought and seeds are easily dispersed through flowing water. They are commonly found in wet woods, wet meadows, fens, and at the edges lakes, rivers and ponds. The leaves may die back during extreme winter. It can withstand mild winters. 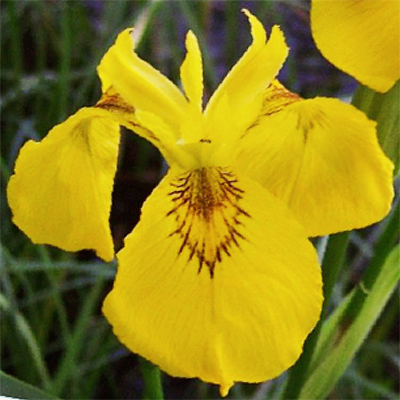 Reproduction of the yellow flag iris is through seeds and spreading underground rhizomes that bring plenty of dense stands of long stiff leaves and yellow spikes showing above the water surface. The cluster can be divided by cutting the rhizome. New plants grow from the fragments of rhizome and they get separated from the parent plant and reach new habitats. Seeds travel to long distances through flowing water and start germinating when suitable habitat is reached. The right time to divide the clumps is during the autumn. The seeds of the plant can germinate even after a fire in the wetland areas. The plant can invade the irrigation canals, ditches, and shallow ponds, shorelines of lakes and streams and marshy areas and can cause flooding in the areas by blocking the flow of the water. They cause the extinction of native plant species and threaten the animal diversity of the area. Though this plant is avoided generally by the grazing animals, if the livestock ingests the plant it can sicken the animals. It can cause skin irritation in humans. As the plant is resistant to large animals and is not damaged much by any diseases, biological control is not an option to control the spread and growth of these plants. Small infestations can be removed by pulling out the plants with hands. Regularly monitor the sites for re-emergence. Digging of the land helps in reducing vegetative spreading. Spraying the plant with registered herbicides like Glyphosate is the option for aquatic areas.